TRP-C34X RS232/422/485 Serial Server provides a transparent way of connecting Serial devices over Ethernet. It can transmit data between the Serial and Ethernet interfaces bi-directionally. To establish automatic or remote data acquisition, TRP-C34X Serial Server also provides 3KV optical isolation and surge protection to protect system from ground loops and destructive. By specifying the IP address and the TCP Port number, a host computer can access different Serial Devices such as Serial Thermometers, Magnetic Card Readers, Barcode Scanners, Data Acquisition Systems, POS Terminals, Industrial PCs etc., over the Network, you can centralize Serial Device management and distribute the management to different hosts at the same time. TRP-C34X makes possible to access distant Serial Devices over Network as if they were directly connected to the Standard COM Port of a Personal Computer. 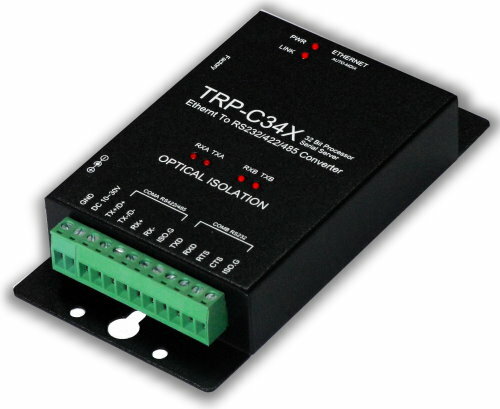 TRP-C34X supports different modes of operation allowing user to operate the system in different environments. TRP-C34X comes equipped with COM drivers that work with Operating Systems WINXP /Vista/2003Server/2008 Server (32-bit & 64-bit), 2000 Server OS, Win 7 (32-bit & 64-bit),WIN8/WIN8.1(32/64bit), The driver establishes a transparent connection between host and serial device by mapping the IP: Port Number of the TRP-C34X’s Serial Port to a local COM Port on the host computer. In TCP Server mode, TRP-C34X provides a unique IP: Port address on a TCP/IP network. TRP-C34X waits passively to be contacted by the host computer, allowing the host computer to establish a connection with and get data from the serial device. This operating mode supports up to 4 simultaneous connections, so that multiple hosts can collect data from the same serial device—at the same time. 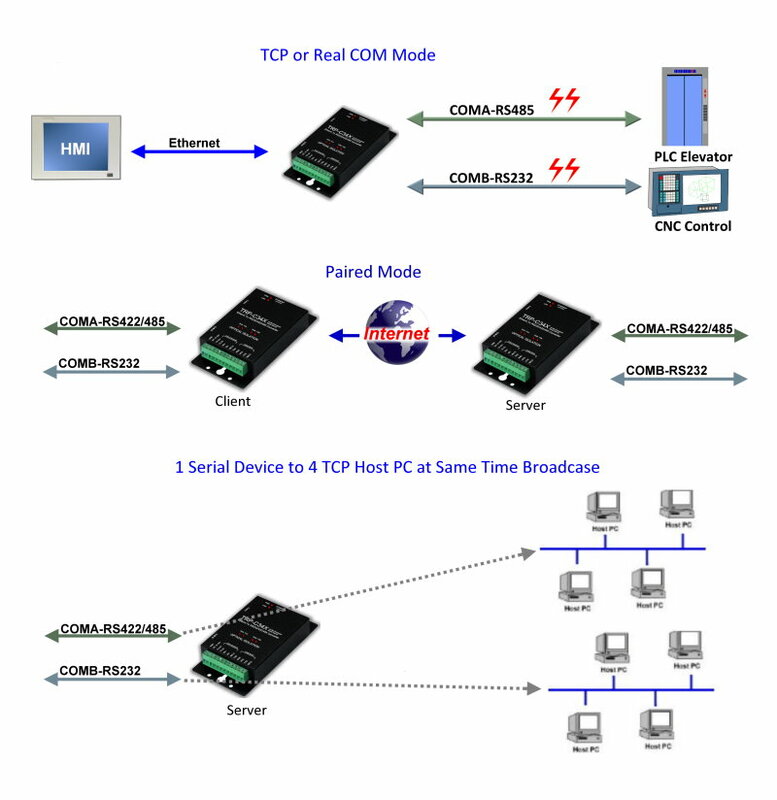 In TCP Client mode, TRP-C34X can actively establish a TCP connection to a pre-defined host computer when serial data arrives. After the data has been transferred, TRP-C34X can automatically disconnect from the host computer by using the TCP alive check time or Inactivity time settings. This Operating Mode supports establishing the TCP connection up to 4 Destination Hosts. When TRP-C34X working at unstable voltage industrial environment, the hardware circuit detection can prevent the power fail cause of the boot fail and Re-Boot. Maximum allowed bandwidth is 460 Kbps per Serial Port. Features Accessible Imps List to add or remove “legal” remote host IP Addresses to prevent unauthorized access to TRP-C34X. Features Auto IP Address Report to periodically report the IP Address of TRP-C34X to the assigned Host on Network. Virtual COM drivers for WIN XP /Vista/2003Server/2008 Server (32-bit & 64-bit), 2000 Server OS, Win 7 (32-bit & 64-bit),WIN8/8.1(32 bit&64bit). Power/Link and 2 pair Serial RX/TX mode LED indicator. CPU:32 bit 170MHZ with MMU. RS-232: TXD, RXD, RTS, CTS, ISO GND. RS-422: TX+, TX-, RX+, RX-, ISO GND. RS-485: Data +, Data –, ISO GND. Supports Real COM mode using RFC 2217 protocol. Protocol: ICMP, TCP/IP, UDP, DHCP, Boot, Telnet, DNS, SNMP, HTTP, SMTP, SNTP. Power consumption: 12V/230 mA (without external device). Operating Temperature: 0 to 65 °C.